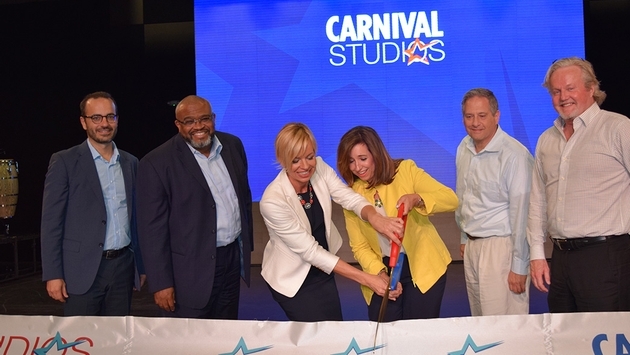 Carnival Cruise Line unveiled Carnival Studios, a state-of-the-art new rehearsal space located in Davie, Florida, that will help elevate the line’s award-winning entertainment. “Whether it’s our elaborate production shows, our popular rock bands or solo artists performing throughout the ship, entertainment is a huge part of the Carnival vacation experience and this spectacular rehearsal space provides us with unprecedented opportunities to develop exciting new choices for our guests,” said Sarah Beth Reno, Carnival’s vice president of entertainment. The studio was designed to be the creative hub of Carnival’s entertainment department. It contains eight music studios, five full stage dance studios, a training room and a green room as well as office space for Carnival’s entertainment department. Its theater stages duplicate main stages within the fleet to allow artists to rehearse on land with the latest technology and top-rated talent from Broadway, London’s West End, Las Vegas and the cruise line’s award-winning partners across the globe. “We designed the space to encourage interaction and engagement between everyone who works on our shows – from cast members and musicians to technicians and backstage crew,” said Chris Nelson, Carnival’s senior director of entertainment. “It is in these sometimes intentional and sometimes impromptu collaborations that the strongest ideas take shape, inspiring synergy and building relationships that last a lifetime.". The new studio was opened via ribbon-cutting ceremony on May 17 with members of the executive management team, including Reno and president Christine Duffy.